This is a blast. Blake is the perfect host, the boat is very well equipped and you feel safe in his hands. We spent a few hours going far up Clayquot Sound, pulled some crab traps, some prawn traps, and took in the incredible views. I highly recommend this kind of adventure. 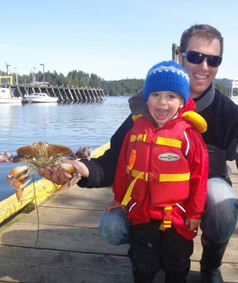 If you’re not into fishing, don’t worry because the crabbing and prawning are a blast and the scenery is breathtaking. Blake’s knowledge of the area add that much more to an already excellent time.